Our patented design utilizes stainless steel support rods vs. typical aluminum against UHMW or other plastic-type composites. It is laboratory tested to exceed 65 tons of sheer. Exclusive bronze oil-lite bushings with zerk grease fittings and dual wipers keep salt, sand, and silt off stainless rods. Anodized aluminum body won't chip. 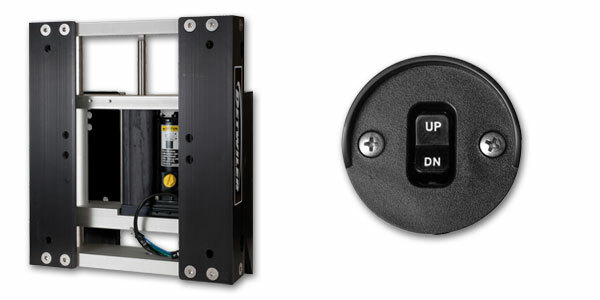 The Detwiler D3000 Series Jack Plate comes in 4”, 6”, and 8” setbacks and provides an integrated hydraulic actuator to give you complete control of your plate. Optimize performance while under way. engines including the latest generation of 4-strokes. The fully integrated hydraulic actuator, with self-purging reservoir, provides smooth powered height adjustment. 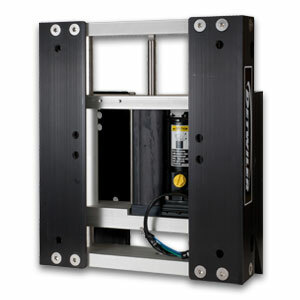 With the actuator unit integrated into the plate, there is no need to sacrifice boat space for a pump or hydraulic lines. 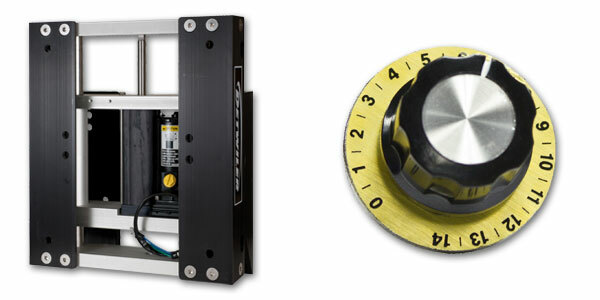 Optimized lift speed provides precise positioning that will not overshoot. strong resistance to torque lock. Fully captured slide mechanism prevents over-extension of the plate. Integrated grease fittings allow for easy maintenance and long life. The stainless steel guide rods with wipers are corrosion resistant and self-cleaning for low maintenance and high reliability. Up to 6 inches of stroke depending on control method. Standard B.I.A. mounting pattern for simplified installation. 300 horsepower capacity to handle the most demanding outboard engines, including high torque 4-stroke engines. Aircraft grade 6061-T6 aluminum alloy providing light-weight, high-tensile strength and corrosion resistance. Precision machining from work-hardened, extruded billet for increased strength. Military standard anodized surfaces for corrosion resistance and increased life in saltwater applications. Stainless steel hardware for corrosion resistance. 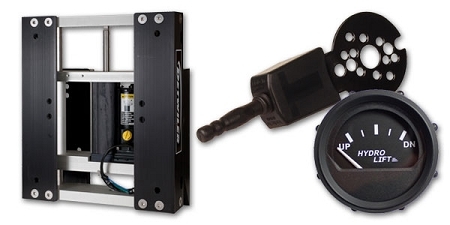 OBD400 - 4000BD - OBD400A JP304OR With Toggle Switch 4" 6"
OBD600 - 6000BD - OBD600A JP3060R With Toggle Switch 6" 6"
OBD800 - 8000BD - OBD800A JP3080R With Toggle Switch 8" 6"
OGT600 - 6000GT - OGT600A JP3060T Gauge & Turn Signal 6" 6"
OGT800 - 8000GT - OGT800A JP3080T Gauge & Turn Signal 8" 6"
OEZ600 - 6000EZ - OEZ600A JP3060X With Ex-Zact Dial 6" 6"
OEZ800 - 8000EZ - OEZ800A JP3080X With Ex-Zact Dial 8" 6"
Quick and easy adjustment of your jack plate with the flick of a switch. Adjust your jack plate right where you need it with fingertip control. Maximizes your precision. Dial in the perfect setting every time with the easy to use EX-Zact Dial.